A 17-year-old pregnant teen lost her flight when TSA agents insisted she had to check her bag, which has a replica gun attached to it. For once, I'm going to defend the TSA: this girl is a naff assclown. I'm not a fan of the TSA. Sometimes their agents are overzealous bozos with a tendency to abuse their authority. But in most cases, they do their job by the book and they are right. This time, that's exactly what happened. I mean, look a the gun in that handbag. It's attached to it, but it looks like a real gun. The TSA agents at the Virginia airport thought the same. They examined it, determined it could pass as a replica and told the girl to check in the purse. It's pretty simple, right? No. The girl argued that she had no problems toting her dreadful purse when he took her outbound flight from Jacksonville, her home city (ah, Florida). As a result, she lost her flight and she had to be shipped to Orlando. 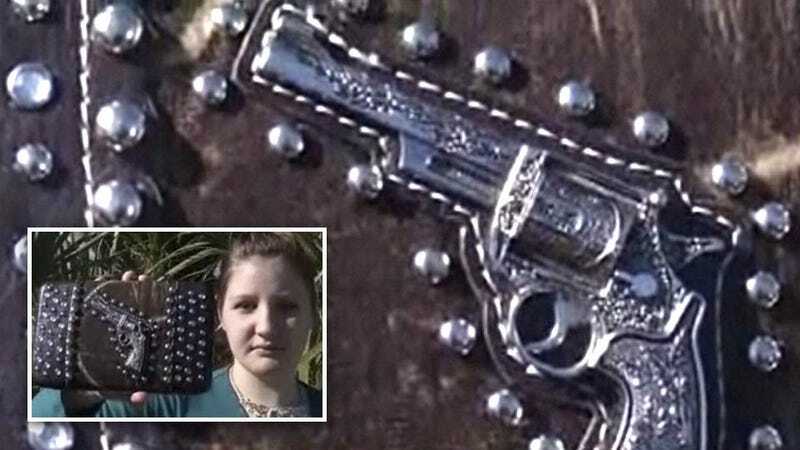 Her defense, talking to News4jax: "It's my style, it's camouflage, it has an old western gun on it." This girl doesn't even know what the word camouflage means, but whatever, who cares.